Aston Villa caretaker manager Kevin MacDonald says his decision to pick James Milner was vindicated by the player's fine display against West Ham. The England midfielder, who is set to join Manchester City and was booed by some fans, scored in a 3-0 win and ended up receiving a standing ovation. "It wasn't easy for him. There were a few grumblings but that shows how good and how tough he is," said MacDonald. "He wants to do the best he can. That's why I had no problems playing him." MacDonald took charge of Villa five days ago following the surprise departure of Martin O'Neill and led his young side to an emphatic win, with Stewart Downing and Stiliyan Petrov also on target. Milner netted the third Villa goal with a fine 18-yard strike in what could be his last game for the club, pending an expected transfer to City. "The latest I heard, there was still a stalemate with Man City. But that could change within hours," said MacDonald. "Within five minutes the crowd realised James is still James. He's an Aston Villa player. The ovation at the end of the game was rightly deserved." MacDonald will stay in charge of Villa for Thursday's Europa League qualifier against Rapid Vienna but his future in the hotseat beyond then is uncertain. Sven-Goran Eriksson, Gareth Southgate and USA coach Bob Bradley have all been linked with the post. "It's too soon after the game to say I want the job (full-time). It can only get worse after winning 3-0 - maybe I should retire now!" said MacDonald. West Ham manager Avram Grant admitted his new side had been comprehensively outplayed by Villa. "I was not pleased with the performance and not with the result, even if the first goal was from a clear offside," said Grant. "We didn't play well. They were better than us. Villa played sharp and quick like we planned to do." 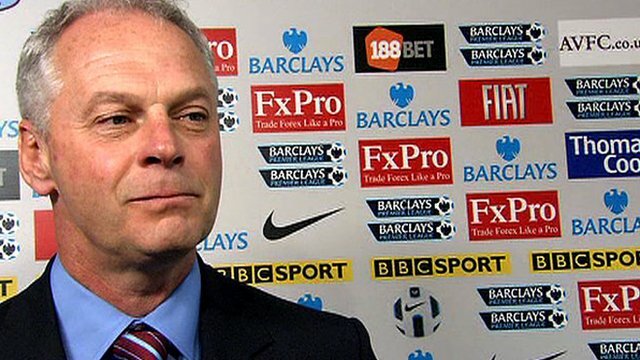 The former Chelsea and Portsmouth boss said he expected the Hammers to bounce back in their next game, against Bolton next Saturday. "One thing you see in all my teams before is that they react well to a defeat like this. There is a lot to learn from this game and I am sure the season will look much, much better."